BabyLegs are all the rage, and legwarmers and armwarmers are popular for adults and teens -- so why not make a kitty version? Today I'll show you how! 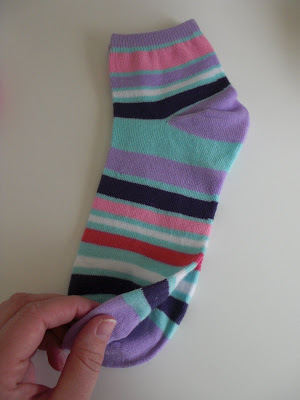 All you need is one pair of socks and your sewing machine! STEP ONE: Stack your socks on top of each other. STEP TWO: Cut as shown. You will remove the side with the heel, then the toe. STEP THREE: Turn down the raw edge end of each sock and hem. STEP FOUR: Fold in half and sew, creating a tube. 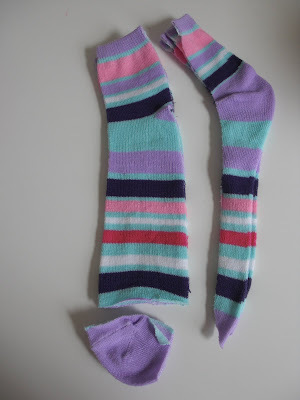 STEP FIVE: Trim of excess seam allowance, turn right side out, and you are done! 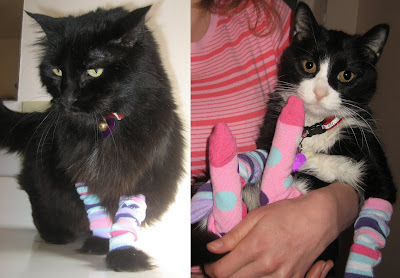 The original sock cuff will go around Kitty's "wrist." Isn't she so fashionable? The stripey KittyLegs really accent her own stripes quite nicely! Just you wait -- KittyLegs are going to be THE hottest trend this season. 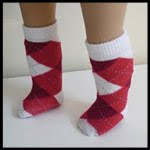 If you like, you can even omit the hemming and create socks instead -- two pair, of course! And no worries: My cat and my sister's cats are very good-natured little kitties. No one lost any blood getting them dressed for their photo shoot! 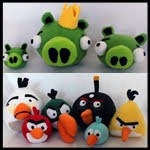 Be sure to check out lots more fun projects today at Crafterhours! Hilarious! I'm a writer at Craftastrophe and I'd love to feature this tomorrow! Please let me know asap! I was reading this and thinking "Gosh, her poor kitties." Will tomorrow's tutorial be a torn sweatshirt a la Flashdance in cat sizes? Oh my! Great April 1st post. Too funny! I even had my husband over here going "poor kitties!" & "good-natured" is an understatement! Our cats are very sweet & only have back claws, but they'd have the legwarmers & the hands holding them in ribbons in no time! They get mad enough about their collars! I used to have two cats, and they would NEVER let me do that to them. I was thinking, "Wow, people will end up with some scratches and lots of her on their sweater with this project"! "lots of fur", not "lots of her"
crazy cat lady, lol, funny!!!! You got me! I was totally thinking you'd lost it :) Happy Birthday to Jelly Bean!!! Ha ha! Love it! I'm surprised kitties put up with it! Lol. My kitties would flip out. Too funny! Happy All fools Day! I just showed the kids and Canon asked, "Is she going to play sports?" Ha! Happy birthday to your little Jellybean too! nice! this one might take the cake! Wow! How 80's! You should make a matching sweatband. Cute pics, and what a couple of good sports you have. They should get a treat for this! The day's not over yet. Make the sweatband WhimWham mentioned. 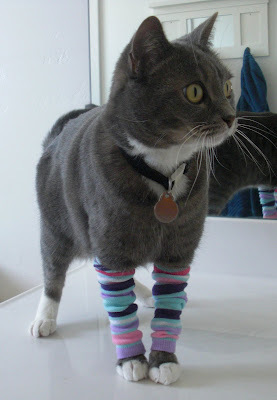 I must see the socks and sweatband together on the cat. Thanks for a proper laugh. I don't care much for April Fool's Day, and I did wonder the point, but people and their pets often do crazy things. And it is very cute! 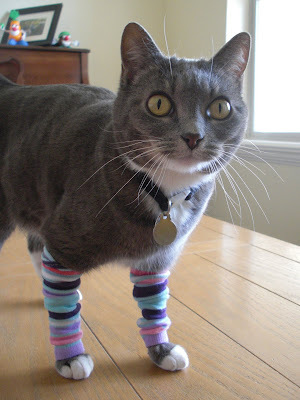 HAHAHA, the picture of the cat wearing them is fantastic! I seriously may have to whip a pair up for my cat before my husband gets home. :) Happy April Fools Day! Oh, yeah, I actually belived it for just a moment. We have a cat who gets dressed in a camo jacket on a regular basis. Ah! You got me!!! Thanks for the laugh. It might be a joke, but it actually sounds like fun! I'm sure my cat would disagree, of course. So funny! I was LOL for real. :) The first kitty knows she looks good - lol! Too funny! I can't believe they let you put them on. I tried getting shoes on my dog once without luck. Despite being an April Fool's I might actually make these. My cat is a huge dork who actually has a baby onesie he wears. Oh, and a harness and leash for going outside. AWWWW! I love this so, so much! Best post ever! Just now read this, so I NEVER saw the April Fool's coming - drying my eyes, I've finally stopped laughing! I just came across your site yesterday, but I actually really like this! I'm gonna make them for my chihuahua, because in the winter she really needs something to keep her legs protected from snow! 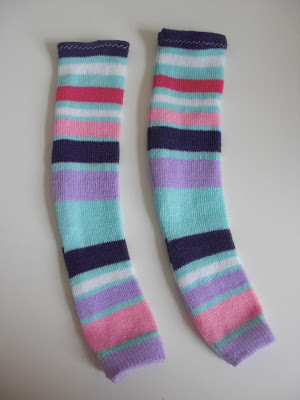 I think I'm gonna make them with fleece lining or something. 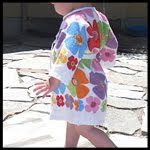 Also like your babyshirt to dogshirt tutorial! 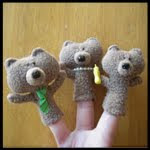 I want to try to make a pair for my dog. I have a Great Dane and his poor legs take a beating during the winter months because of his arthritis. This is a great idea for that! hahaha..very nice. I loved it! 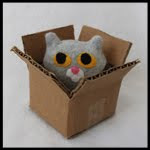 I guess if my cats will wear it but I´ll try. Thanks for yr tutorial. That's so cute! I loved the idea and I will do for my Zeus! Just do not know if he'll like ... He is not mto fan of clothes do not, when I put the outfit of my football team him, he gets upset ... Here where I live is very wet and cold, but it still does not like wearing any clothes! Haha! I love this! I totally want to do this to my cat and show my husband. 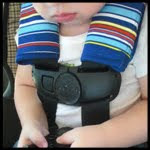 He thinks the ones I made for our son are bad, but these would be hilarious! Cool for chihuahuas not so cool for cats. That is so cute! I am not sure my three cats would like to wear these but they are so cute! And here I was looking for just that thing so my cat would quit attacking the fur on his back legs. Darn. I do not have kitty right now but last one I had would have literally eaten me alive if I tried put those on him!! He was 18 pounds of muscle, teeth and claws!Then he probably would never talk to me ever again. Eight and a half year later and you're still getting people with this! I'm waiting for Sheldon Cooper to pop out and say, "Bazinga." What started out as a joke has turned into an awesome (Pawesome) idea for my Shih Tzu and my mom's Long Haired Chihuahua. 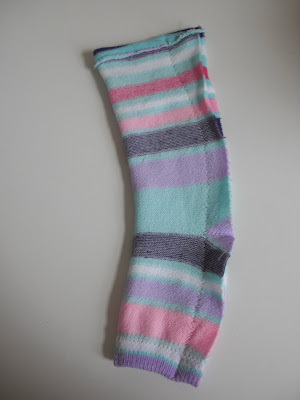 Both are extremely cold natured and I have socks like this that I can't wear. My dog is a good sport, but the trick will be with the chihuahua--LOL! 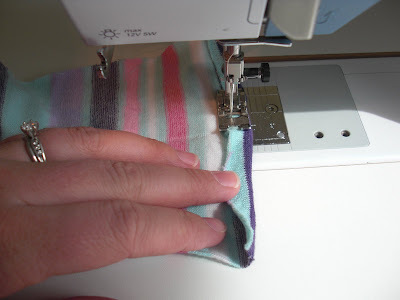 With cold temps in my forecast, I'll be inside playing with my sewing machine!